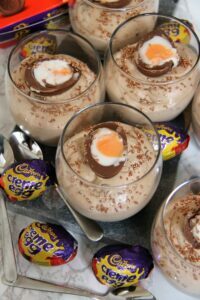 Simple and Easy Three Ingredient Chocolate Mousse Desserts filled with Creme Eggs, and even more Creme Egg on top! 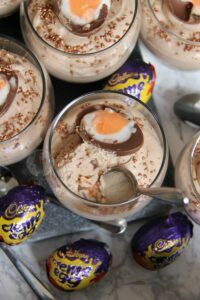 So I got a little bored the other day, and thought I would make something with ALL the creme eggs in my cupboard. 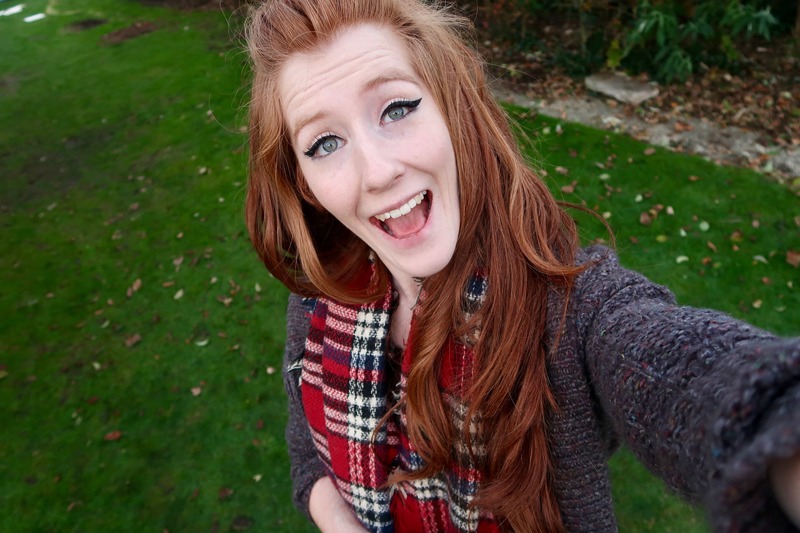 Like I went a little overboard perhaps and bought far too many bags of Creme Eggs, mini and normal size! But anyway… This dessert happened. Individual Chocolate Creme Eggs Mousses… oh my. 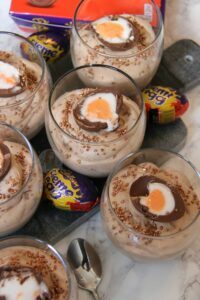 This mixture isn’t like my normal Chocolate Mousse recipes as I wanted to try something different that didn’t require eggs for example. 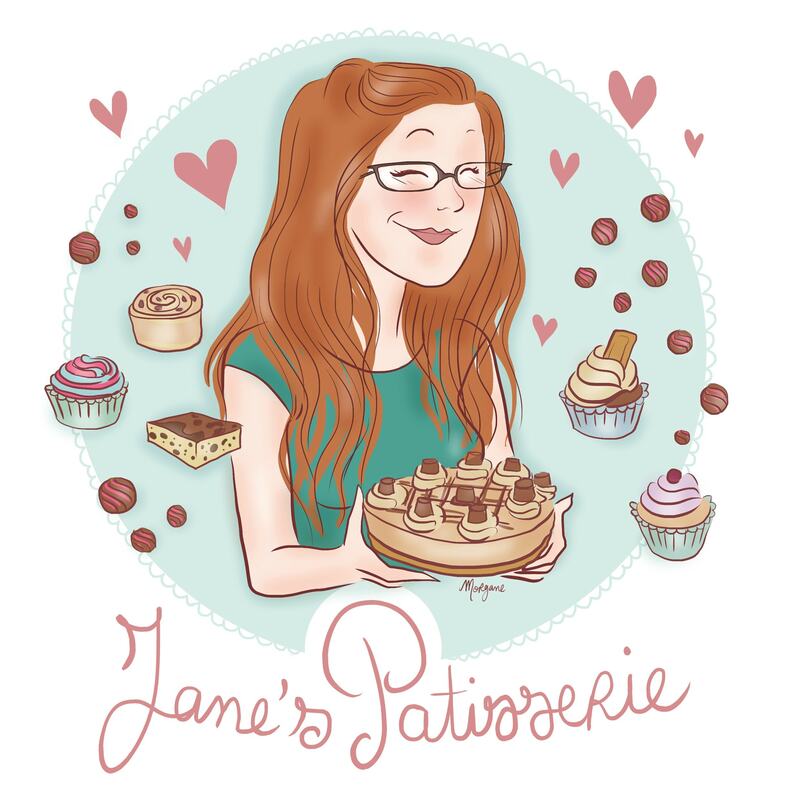 One thing I realised that was with all of my No-Churn Ice Creams, such as my No-Churn Crunchie Ice Cream or my No-Churn Nutella Ice-Cream, they taste AMAZING before being frozen. Its obvious that they would really as its only just cream, condensed milk, and whatever flavouring you chose. This made me think, if it freezes to make Icecream… would it work as a Mousse? YES IT DOES. Seriously? It is quite sweet. 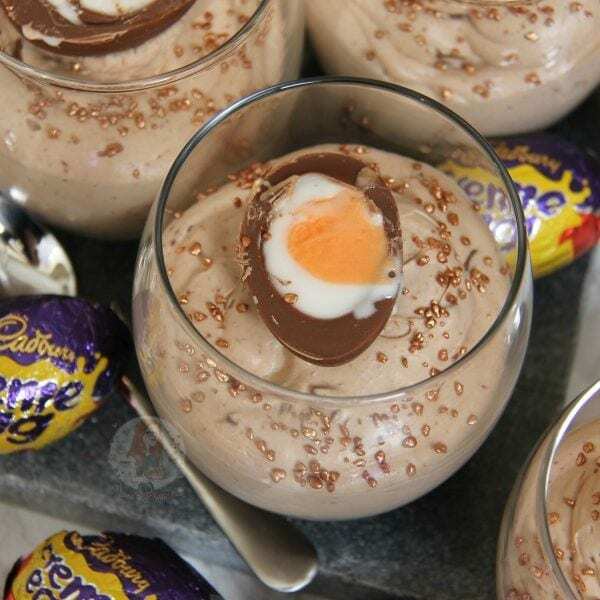 The Creme Eggs does increase that sweetness, and this makes a DELICIOUS three ingredient Chocolate mousse by itself so seriously. Heaven. Whipping the Double Cream, Condensed Milk, and Melted Chocolate together is so insanely easy! Like, all you do is melt the chocolate, then pour the ingredients into a bowl, and whisk till thick. One thing you might struggle with though, is not eating it ALL before it makes it to the glasses. I would advise sorting it out, and eating a little bit of leftover you *accidentally* left there… or you might make a deliciously regretful decision. 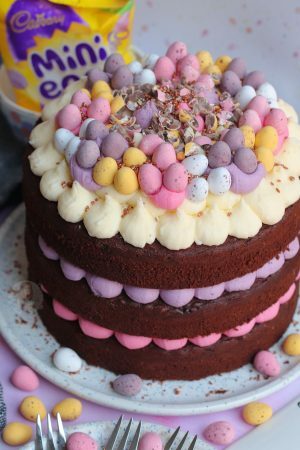 My Creme Egg Cupcakes were such a hit that I really hope all you Creme Egg lovers love this too. In my opinion, I still love my No-Bake Creme Egg Cheesecake more, but honestly… I even question that. THIS IS SO YUMMY! Enjoy! In a heatproof bowl, melt the Milk Chocolate till smooth. In your mixing bowl, add your Double Cream, Condensed Milk, and the Melted Chocolate and whisk till very thick! 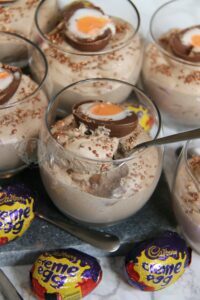 Fold through some chopped up Mini Creme Eggs and pour/pipe into some glasses/pots. I used Mixer Glasses! Sprinkle on some sprinkles of choice. Add a half of a Creme Egg to each mousse and refrigerate for at least 3-4 hours and then ENJOY! 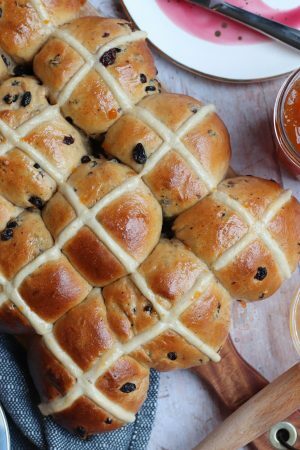 You can use Dark Chocolate in this recipe instead of Milk, but I wouldn’t advise using White as it would be far too sweet! These will last in the fridge for 2-3 days, but are delicious when freshly set. Even the mixture is delicious! 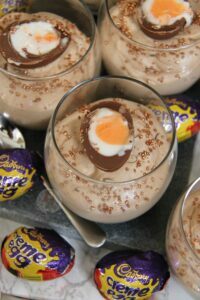 You don’t have to use any Creme Eggs in the mixture if you don’t want as this makes a delicious Chocolate Mousse by itself. 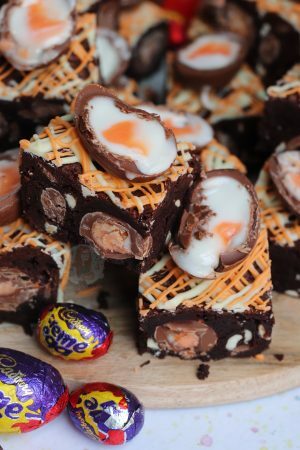 You can also switch to any other easter treat you like, or any other chocolate such as Rolos or Munchies for example! Find my other Creme Egg & Easter Recipes on my Recipes Page! Older Next post: Double Decker Cookies Bars! Newer Previous post: Mars Bar Fudge!